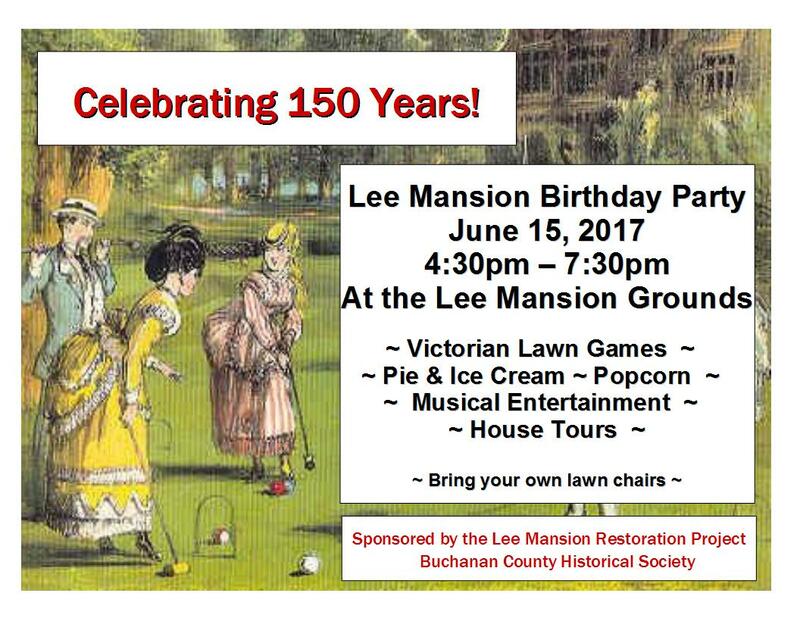 Save the Date and Join Us for The Lee Mansion Birthday Party June 15th! Much to report. Something new each day. The Waterloo Courier was here on Tuesday so watch for a feature soon about the project. Both the writer and photographer were very interested in the project. Thanks to Anita Miller for setting this up. Hopefully they will return when the gardens are in full bloom. 400 plus people went on the Independence Public Library's Tour of Historic Homes this weekend with many stopping at the Lee Mansion as well. The Historical society received over $1000 in donations from the tour in addition to more exposure of the project. Lots of interest. Please thank the folks at the library for all their work to make the tour come off so well. Window production has begun with mid April delivery date projected. Metal tear out in basement is close to done with ceiling removal next. Larson construction estimator is close to being done and when he is we will have a meeting of the key construction players. The design assistance related to energy issues is underway thanks to Indytel and WPPI (Kevin Sidels and Tom Westhoff). They have toured the building and are anxious to help. Lots of energy challenges for this building with how to insulate at the top of the list. Events committee has been meeting. Lots of cool things in the works. 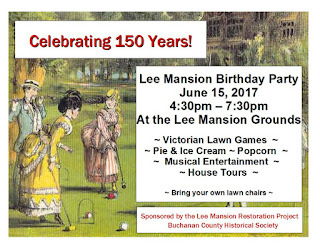 A 150th Birthday Party is scheduled for Thursday, June 15. More information to come. 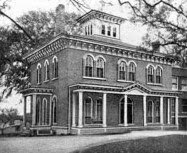 As we approach the 150th birthday of the Lee Mansion(1867-2017), there is much to report on our progress . The Mansion currently has limited electricity, no plumbing and no heat. The good news here is that this makes us eligible for assistance from Mid American Energy and Indytel/WPPI. This includes audits and incentives to use energy efficient means to heat and light the facility. We have been accepted for design assistance services from WPPI ; they are helping us through the decision making process for the west windows. Windows are a long term decision and there are so many options. The masonry work to prepare the openings for windows is complete and we will order windows soon. Work days are on hiatus till the weather warms but thanks to all who helped with flooring tearout and major clean up. Basement still needs much metal removal. We are working on a calender of events as well as partnerships with other groups such as the Library and Master Gardeners. Fund raising is a huge priority for 2017 as is building our base of volunteers interested in bringing the LM back to life. Happy holidays to all who are interested in this project. Have you noticed the tree lights in the windows? Much to report on progress of the LM project. More later. Come visit the Lee Mansion and see the progress we have made this year. Slightly decorated for the season. One evening only Friday Dec. 16, 2016 4-7pm also visit the library at the same time for "Santa"
WELCOME to The Lee Mansion Blog. This is Steve Pilcher at the keyboard. The goal of this Blog is to share information regarding the project progress and goals with friends, neighbors, community organizations, and the general public. We encourage our readers to follow along, make comments, and share our message.